Pave engagement rings are beautiful works of art where the jeweler will set small diamonds where there are multiple rows (usually not less than three rows) of off-set diamonds where there is no metal between diamonds. Pave is where the entire area looks covered in the diamonds or looks 'paved' creating sparkle all over the pave area. Most pave engagement rings are wider than traditional engagement rings because of the necessary gold to ensure its durability. 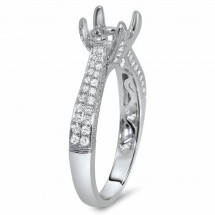 Pave engagement rings are so beautiful that they are often worn as wide bands in place of a large diamond. 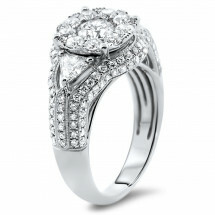 However, pave engagement rings are varied because of the different engagement ring styles designed today. 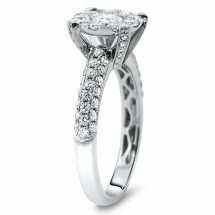 Halo rings, three stone, vintage or modern, pave has been introduced into all styles of engagement rings. Pave halo rings have a 'pillowy' look to it. 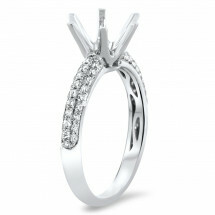 Where the halo would be flat on the side, diamonds would have a smooth subtle arch to the center stone. 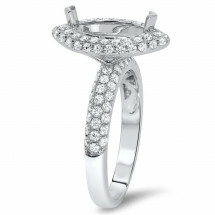 The use of pave set diamonds creates a fuller look on three stone rings as well. Three stone rings are wide in the center and taper smaller outward adding pave set diamonds creates a vintage look with a modern appeal. 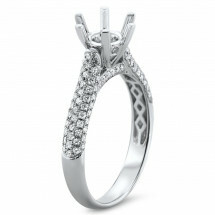 Adding pave set diamonds to any design produces a timeless look with tremendous sparkle. Today, we are seeing pave and micro-pave becoming an interchangeable term used when an engagement ring has small prongs holding small round stones despite the number of rows of diamonds. Technically not pave, the term micro pave is persisting as a design that has less than three rows and is set with prongs. 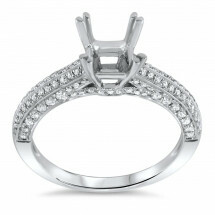 Micro-pave looks like most halos today where there is one row of prong set diamonds that encompasses the center stone. 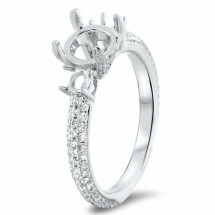 Micro-pave is a much slimmer design without the time consuming artistry of a true pave engagement ring. Pave engagement rings need to have each diamond perfectly level to the stones next to it, otherwise it creates dark areas in the ring, but when they are set properly the sparkle seems endless. 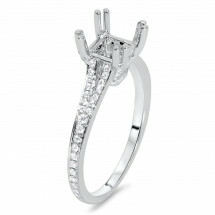 The jeweler will hand set each diamond and must polish and shape each prong to make it look it is not even there. 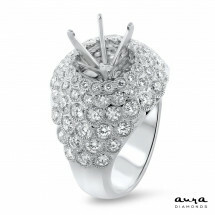 It can be argued that a jeweler can spend more time on a pave engagement ring than any other. Although the pave engagement rings looks like diamonds can easily become loose or lost, it may be one of the most secure designs ever. Many pave set diamonds are set with 6 small prongs and they will share the responsibility of securing more than one diamond. This results in two diamonds being held in by the same prong(s) ensuring a close and tight fit for each diamond. 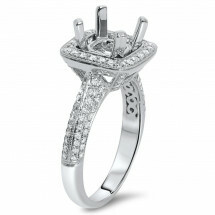 Pave engagement rings have a grace and sparkle like no other design can offer.